A BIG THANK YOU to our very good friends Wildcat Sanctuary for sharing our post about Tony’s new petition with 2,965,839 of their friends. Please “LIKE” Wildcat Sanctuary – they are one of the sanctuaries that have a standing offer of a home for Tony. Lately, concerned truck stop visitors have reported that Tony’s health appears to be in decline. A life of psychological and physical distress is taking its toll on Tony. It’s critical that we take every possible path to free him and let him live out his life at a reputable sanctuary where he can enjoy the space, environment, and veterinary care he deserves. 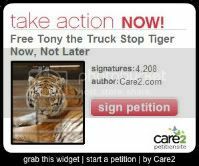 Sign the petition urging Louisiana’s governor to take all possible action to protect Tony and ensure no other big cats reside at the truck stop in the future. 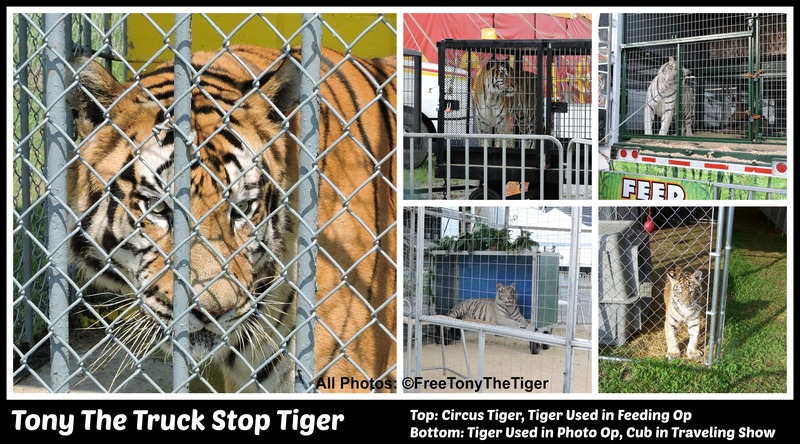 As the month of July begins, we mark another year of captivity at Tiger Truck Stop for Tony. It is reported Tony was born in July of 2000 and acquired as a cub that year from a Texas breeder. 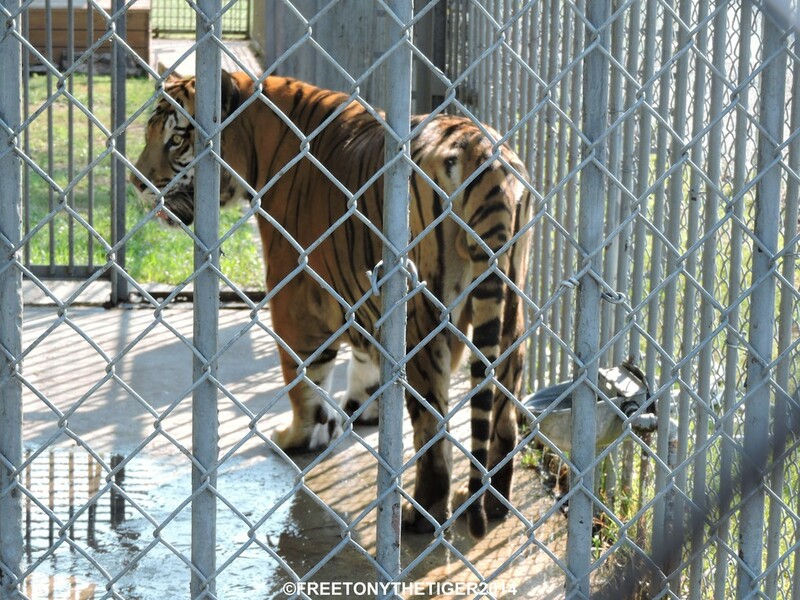 Back in 2009, we learned about Tony from Big Cat Rescue in Tampa Florida, and wanted to do whatever we could to help him, gain support for his release to a reputable sanctuary and raise awareness for captive tigers in the United States. By bringing his story to social media, people from all over the world learned about Tony and the captive tiger situation in the U.S. With more privately owned tigers in the United States (est. 5,000 plus) than left in the wild (appx. 3,200) support for legislation banning private ownership is very important. The Big Cat Public Safety Act is a federal law that would end the private possession of big cats as pets, props and for their parts. Please help with the passage of this law by contacting your member of congress and asking them to support the bill. Visit: stopbigcatabuse.com where you will be able to contact your representative by phone, e-mail or Twitter. ALDF has vowed to continue fighting for Tony’s release to a reputable big cat sanctuary – and to also keep fighting for Tony to honor the memory of Candy, a chimpanzee held captive for decades at Dixie Landin’ amusement park in Baton Rouge, Louisiana in lonely, cramped cage without any interaction with other chimps. 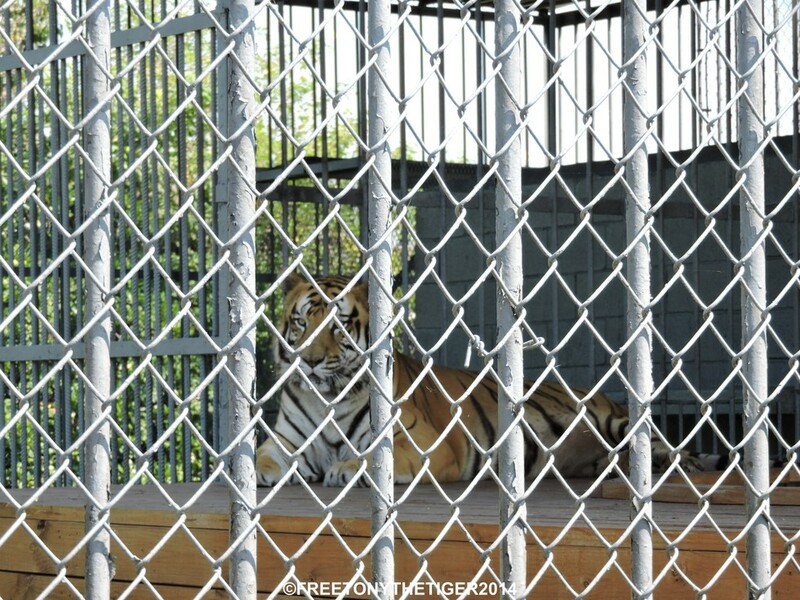 Our final THANK YOU is to ALL of Tony’s friends for their positive support and dedication to this beautiful tiger and to Tony’s release to a safe, clean home that will provide him with the care and respect all animals deserve. 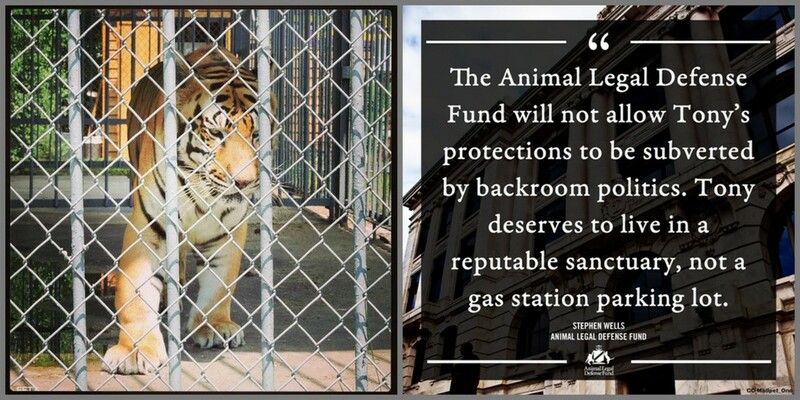 Please continue to support Tony, the “Free Tony The Tiger Campaign”, his legal representatives ALDF, and the wonderful sanctuaries mentioned in this post. Personal Note: Visiting Tony, I vowed: We Will Never Stop Fighting For You Handsome Boy…and WE NEVER WILL! This beautiful watercolor painting of our handsome Tony is a work in progress by Steve Cavallo ( stevecavallo.com ) we just had to share. International Tiger Day, or Global Tiger Day. was created at the St. Petersburg Tiger Summit in 2010 and is celebrated on July 29th. Its’ goal is to raise world awareness for wild tigers and support for their conservation…we’d also like people to recognize the problem of captive tigers since the U.S. has a significant role to play in ensuring captive-bred tigers don’t feed the global black market for tiger parts. It is now estimated that close to 3,900 tigers remain in the wild, up from the previous estimate of as few as 3,200 in 2010…but in the United States there are more than 5,000 privately owned tigers! One of the ways you can help captive U.S. tigers is to support legislation to ban private ownership. Ask your congress members to support the Big Cat Public Safety Act. Visit: catlaws.com for more info. Our sincere gratitude to the Animal Legal Defense Fund for their extraordinary representation of Tony and dedication to him. Please visit aldf.org to learn more about them and their tremendous work to help animals through the legal system. Petitions provide a platform to keep people supportive, involved and updated as well as to demonstrate the interest and support Tony has worldwide. Tony has become the “Ambassador” for captive U.S. tigers and has raised awareness to this serious issue globally through social media. We truly appreciate everyone’s dedication to Tony and positive support of his release to a reputable big cat sanctuary. International Tiger Day, or Global Tiger Day – created at the St. Petersburg Tiger Summit in 2010 – is celebrated on July 29th. 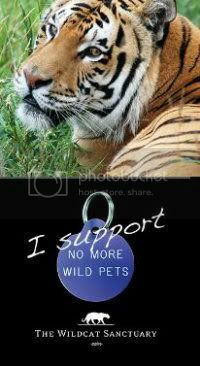 Its’ goal is to raise world awareness for wild tigers and support for their conservation. Tigers are magnificent majestic big cats who deserve our utmost respect, protection and advocacy. 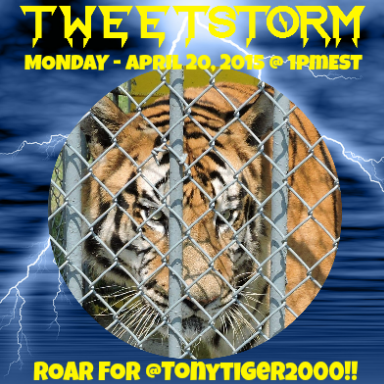 We ‘d like to contribute to this important day by posting links to visit to learn more about wild tigers, captive tigers, and of course to show our love and support for Tony ~ who has himself raised awareness to the plight of captive tigers in the U.S. Sadly there are only an estimated 3,200 of Tony’s “cousins” remaining in the wild, a decline of 97% since the turn of the century. Six sub-species remain: Amur, Bengal, Sumatran, Indo-Chinese, Malayan, South China (functionally extinct – has not been sighted in the wild for more than 25 years); three are extinct: Bali, Caspian and Javan. Poaching, human-tiger conflict, loss of habitat and prey are the main threats to tigers. TAKE ACTION! Protect Tigers: Keep Them Out of American Backyards! One of the most important ways we can help tigers like Tony and other captive big cats in the United States is to support The Big Cats and Public Safety Protection Act. This bill would prohibit the private possession and breeding of captive big cats in the United States except at highly-qualified facilities like accredited zoos where they can be properly cared for and safely managed. It would only allow breeding at accredited zoos, along with some research or educational institutions. 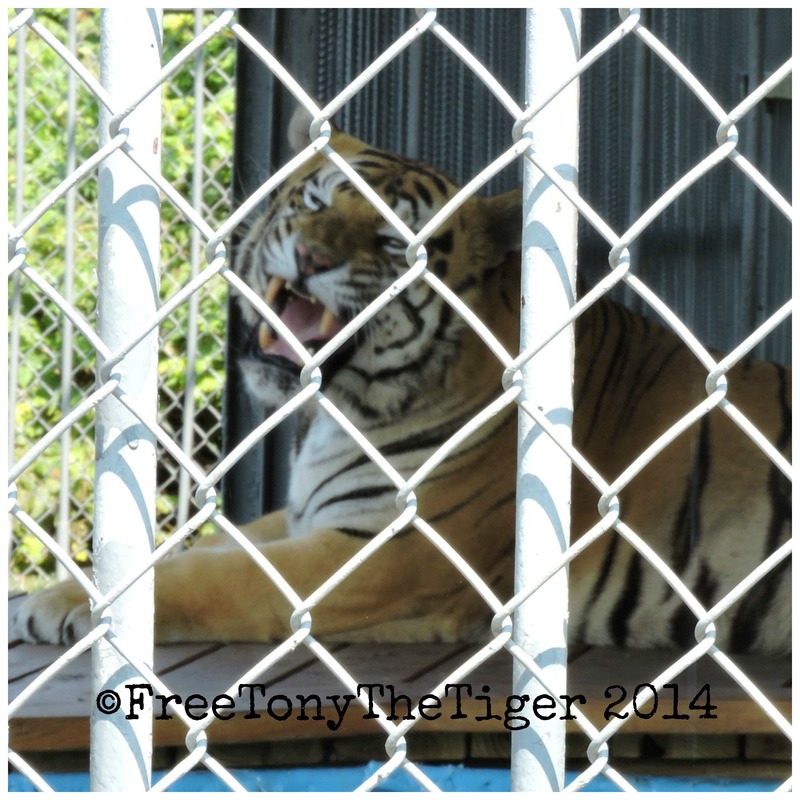 We truly appreciate everyone’s dedication to Tony and support of his release to a reputable big cat sanctuary. Tony has become the “poster tiger” for captive U.S. tigers and has raised awareness to this serious issue globally through social media. A recent Dodo article about Tony’s 15th year at Tiger Truck Stop got tremendous response and support when Mr. Ricky Gervais tweeted it. Special Thanks to Animal Legal Defense Fund for their extraordinary representation of Tony and dedication to him. Please visit their site to learn more about them and their tremendous work to help animals through the legal system and support their Animal Bill of Rights. Please share this post and ROAR FOR TIGERS on GLOBAL TIGER DAY! Tony The Tiger: 15 Years at Tiger Truck Stop! 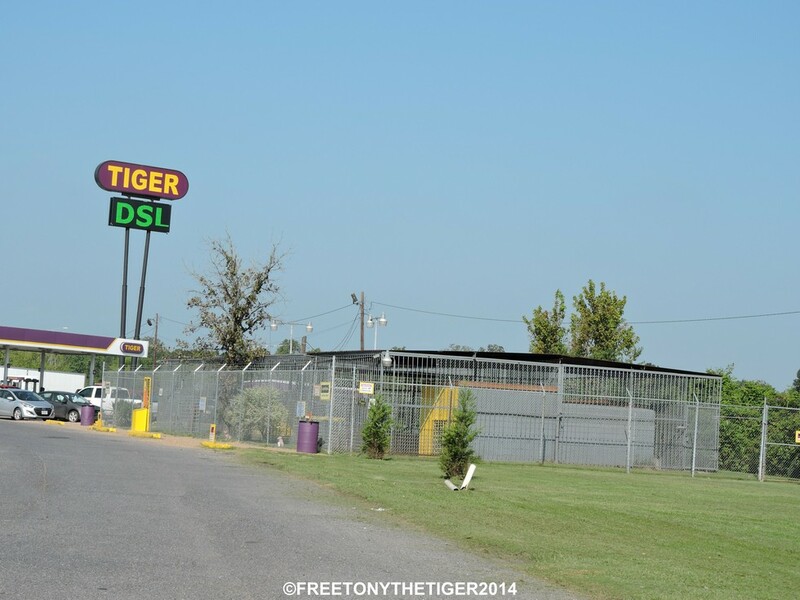 As we celebrate our nation’s independence on July 4th, we also mark another year in Tony’s life, one that has been spent in captivity and exploitation as a roadside attraction at Tiger Truck Stop in Grosse Tete, Louisiana. Signs posted on Tony’s cage, indicate he was born in July 2000, now making him 15 year old. It is reported that Tony was acquired by Michael Sandlin as a 6 month old cub from a Texas breeder. Anyone who has followed Tony’s story has experienced both its’ highs and lows…hard fought victories in court by the Animal Legal Defense Fund found the permit issued by the Louisiana Department of Wildlife and Fisheries was illegal and revoked; LDWF was blocked from issuing a new permit. Each victory was met with an appeal by Tony’s owner, Michael Sandlin, and subsequently each appeal was denied. After exhausting all of his options via the courts, Michael Sandlin enlisted his state Senator, Rick Ward, to propose a bill, SB 250, to exempt himself from Louisiana state law banning private ownership of big cats. This outrageous bill passed both the Senate and House and was signed by Governor Jindal recently. Immediately the Animal Legal Defense issued a statement saying they would challenge the validity of SB 250. On June 25, 2014 ALDF filed suit against the State of Louisiana for violating the Louisiana Constitution by passing a law that exempts a single individual from existing state public safety and animal welfare laws. Defendants include the State of Louisiana, the Louisiana Wildlife and Fisheries Commission, the Louisiana Department of Wildlife and Fisheries (LDWF), the Tiger Truck Stop, and Michael Sandlin. While Tony’s case remains embroiled in a legal battle, we remain positive, supportive and continue our advocacy on his behalf. Tony’s change.org petition asking the Louisiana Department of Wildlife and Fisheries to enforce the 2006 law banning private ownership of big cats remains open and is nearing 49,000 signatures. 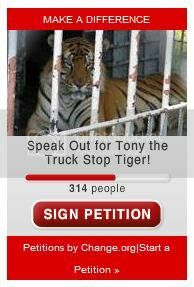 Petitions reach people worldwide and keep Tony’s story networked and people updated and supportive. Tony has great support on social networking sites; he has been nominated twice for a Shorty Awards which recognize the best in social media. Tony has standing offers of a home at these sanctuaries, please visit the links to learn more about them. Once again we thank all of Tony’s friends for their support and for caring about him. Because of you, Tony’s ROAR will never be silent. We remain faithfully committed to Tony and look forward to his release to a wonderful sanctuary. Thanks to these compassionate young people for caring about Tony and taking such positive measures to advocate on his behalf and to their teacher for providing such a wonderful animal advocacy project and selecting such an important issue – privately owned tigers in the U.S. As we say on Twitter – Tony IS the Captive Tiger Ambassador. Thank You Animal Legal Defense Fund for your dedicated & continued efforts to secure Tony’s release to a reputable big cat sanctuary. You have the support of Tony’s friends from all over the world. Animal lawyers aren’t the only ones roaring about cruelty to captive animals like Tony the tiger. Kids care too. Tony’s plight—being confined at a Louisiana truck stop parking lot—and ALDF’s ongoing legal battle to release him from that concrete nightmare got the attention of one awesome 4th grade class at Guilmette Elementary School in Massachusetts. This spring, Ms. Buck’s 4th grade class used Tony’s cause to shape a persuasive writing and research project. Students were so excited about Tony, Ms. Buck says, the project “took on a life of its own.” Students created posters and circulated petitions as part of this project, and wrote letters to Louisiana Governor Bobby Jindal, asking him to take Tony’s suffering seriously. During their research, the students learned about the Animal Legal Defense Fund… as they read articles about Tony in which you were quoted. They suggested that I forward a sample of their work to you directly because they believe you will be supportive of their efforts. The Animal Legal Defense Fund is touched and inspired by the dedication of these young advocates. Their letters urge fairness and humane treatment of animals like Tony, and his release to a reputable sanctuary. They also make persuasive arguments backed up with at least three points of solid evidence to prove their points and maintain a truly fair and balanced tone, appealing to the governor’s ethical and responsibility. Want to get your class involved in advocacy projects for animals? Check out ALDF’s brand-new youth advocacy action kit!